We have all looked forward to Spring this year, waiting for those snowbanks to finally melt so we can drive and walk and ride our bikes more easily. But we will face other challenges soon as construction projects return to the roads. National Work Zone Awareness Week is now being observed by safety officials across the country. The annual campaign is held at the start of construction season to encourage safe driving through highway work zones and construction sites. The goal is to protect drivers, passengers, construction workers and others from injuries. Drivers and passengers are at the greatest risk in a construction zone, accounting for an average of 85 percent of the deaths in highway work zone crashes, according to the Federal Highway Administration (FHA). In 2010, 576 people died in work zone crashes, the equivalent of one work zone fatality every 15 hours in this country, according to FHA. 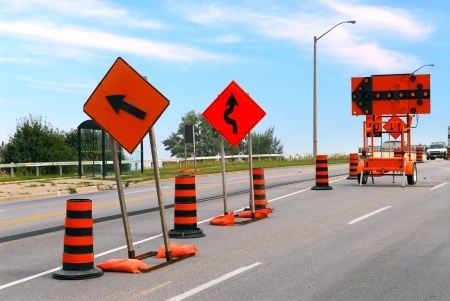 Construction workers face many risks on highway work zones. In 2013, 105 construction workers died at road construction sites in this country, according to the Bureau of Labor Statistics (BLS). Other injuries are not included in this figure. Transportation accidents accounted for 66 percent of roadway work zone fatal occupational injuries in 2013. In 69 percent of these cases, a pedestrian worker was struck by a vehicle. Backing vehicles out accounted for 27 of the 48 pedestrian vehicular accidents. Move Over. It’s the law in Massachusetts and most other states. Make sure you move over when you see construction signs and lights. And if additional room is not available, slow down. No Speeding. In Massachusetts, you can face double the original fine for speeding in a work zone and cause a serious car accident. No Distracted Driving. Pay extra attention to the roads as you travel through work zones; reduce distractions in your car from information systems and passengers. No Cell Phone Use. Eliminate distracted driving. Do not use your cell phone to text, check e-mail or social media. If you need to use your phone, use a hands-free system. Expect the Unexpected. You may not have any notice of a work zone until you are stuck in it. Be patient and be prepared to follow the signs and traffic cops and flaggers. This may mean not following the traffic signals at times. Pay Attention to the Signs and Look for Alternate Routes. Look for signs which direct you to detour routes and share other important information. Do not use your GPS until you are safely outside of the construction work zone. Mass511. The state’s traffic information system may help you avoid construction areas. Visit the webpage or call. Use crosswalks in construction areas if it is safe to do so. If not, follow pedestrian pathways which have been marked by the construction operation. Watch how traffic flows before you step out into the street. You may be able to identify a safer path. If you know you will be walking through a work zone, consider carrying a neon glow vest and wear it as you cross a street. You want to stand out to road traffic, police officers and flaggers and the construction crew. Cyclists want to learn about roadway construction ahead of time. After all, there is nothing much worse than a mile of recently milled black top to shake your fillings loose. Call the local town or city hall or call the Mass511 service. Some of the cycling clubs in the Boston area also do a good job of alerting members of safety issues. One popular source of information is the Charles River Wheelmen’s safety articles. Look for cycling clubs in your area and ask if they offer a members forum or a newsletter. Be vigilant about following OSHA and other safety procedures of your profession. If you are working on foot, make sure you are always aware of any vehicles around you and where there are flaggers and traffic cops. National Work Zone Awareness Week. Highway Work Zone Accidents, by the Centers for Disease Control and Prevention. The Boston car accident lawyers at Breakstone, White & Gluck have over 100 years combined experience handling complex injury claims for those who have been seriously injured. We represent clients in Boston, Cambridge, Somerville, Newton, Arlington, Medford and other areas of Massachusetts. If you have been injured, learn your rights. For a free legal consultation, contact us at 800-379-1244 or 617-723-7676 or use our contact form.